Sorting out your dirty clothes, chucking them in the washing machine and waiting for its spin cycle to finish isn't exactly the height of fun. LG wants to change all that with a new washing machine featuring a built-in MP3 player - at least then you'll be able to listen to your favourite tracks while doing your chores. LG Electronics , which has previously developed the internet-enabled fridge, has filed a patent application to introduce consumer electronics to white-goods. Patent application US 2007/0118862 A1 describes a "home appliance with an MP3 player comprising the MP3 player adapted for storing contents; and a washing device for washing or drying clothes, the washing device being connectable with the MP3 player and having a communication function with the MP3 player to play back the contents stored in the MP3 player," according to a ComputerWorld.com report. In other words, LG wants to develop the first washing machine and/or dryer with a built-in MP3 player. Has convergence gone too far? Analysts didn't seem too impressed. "I don't think that there is any ongoing trend involving the addition of MP3 players to everything that doesn't move," said Kurt Scherf, principal analyst at research firm Parks Associates. "On the other hand, it's not too far-fetched to think that someone might want to listen to their music while participating in a mundane chore, such as doing the laundry. But, honestly, I don't get it - why not just crank up the stereo or clip your Apple iPod to your belt?" "To me, it doesn't make a world of sense," agreed Tom Dair, president of international design, product development and brand communications firm Smart Design. "Whistling while you work is helpful, but having the complexity of an MP3 player in your washing machine seems like a mismatch. If you love music, you probably have a wireless system set up in your home, so why bring in this device, which is probably located in a small room? "Another disconnect is that a washer/dryer is not a portable item," Dair added. "An MP3 player makes sense if you're walking down the street, but I'm not seeing many people on the street with a washer/dryer. You're adding a mobile feature to a product that is anchored to the ground in a specific place where you don't spend a lot of time relaxing, or even sitting. But if it makes your clothes come out cleaner, that would be great." 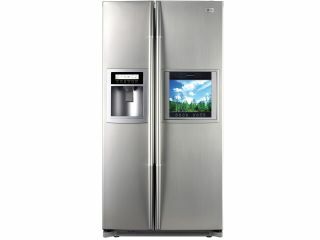 LG has previously added internet and TV capabilities to its fridges. The LG Internet Refrigerator , launched in Korea and the US, was a massive flop. That didn't stop the electronics firm from releasing the $3,999 (£1,976) LG HDTV Refrigerator in May this year though - the first fridge in the world with a high-definition screen. The LG HDTV Refrigerator unit features a 15-inch high-definition LCD screen and FM radio with remote control, a cable connection and a DVD connection. An additional 4-inch screen can display local weather forecasts, a recipe bank and various organisational tools and reminders. It will also display your family pictures downloaded via a USB port.